Doom Patrol (0000) : Série TV de 1 saisons et 15 épisodes diffusée sur . Casting, acteurs, bandes annonces et actualités. 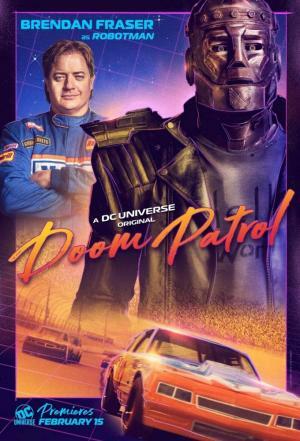 Casting de la série "Doom Patrol"
S01E01 Pilot 15/02/2019 The team, tired of being stuck in Doom Manor, decides to visit the local town while The Chief is away. However, this seemingly harmless field trip leads to some grave consequences, including an encounter with the mysterious and powerful Mr. Nobody. S01E02 Donkey Patrol 22/02/2019 Following Mr. Nobody’s capture of Niles Caulder and the destruction of Cloverton, Ohio, The Doom Patrol investigate the mysterious albino donkey and discover it is a door to another universe, one where Mr. Nobody is in control. Cyborg aka Vic Stone, a part man/part machine hero from Detroit who has his own complicated relationship with Niles Caulder, joins the search. S01E03 Puppet Patrol 01/03/2019 The Doom Patrol set out for Paraguay where they discover the Nazi doctor who created Mr. Nobody and the connection between The Chief and the two villains. 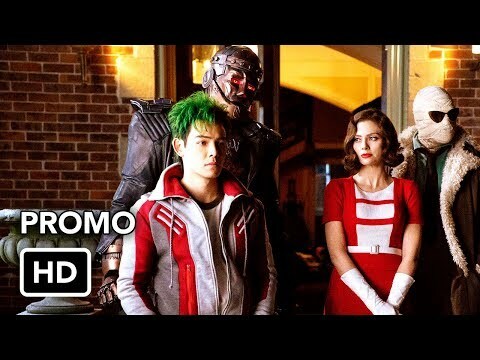 S01E04 Cult Patrol 08/03/2019 Willoughby Kipling conscripts the Doom Patrol into helping him avert the end of the world by stopping a nihilistic cult. S01E05 Paw Patrol 15/03/2019 With the Apocalypse in full swing, the Doom Patrol must work with an unlikely ally – and a very special pug – to stop the end of the world. S01E07 Therapy Patrol 29/03/2019 After a violent outburst from Cliff, the team engages in some self-led group therapy – leading to some growth within the group as they are knit closer together. S01E08 Danny Patrol 05/04/2019 A sentient, gender-queer, teleporting street named Danny who’s being hunted by the secret Bureau of Normalcy needs help from Niles – but gets Vic and Larry instead. S01E09 Jane Patrol 12/04/2019 Jane retreats into The Underground, a treacherous place deep within her own mindspace, where she encounters her many personas and dark traumas of her past. S01E10 Hair Patrol 19/04/2019 Vic and Rita face a dangerous man called The Beard Hunter, who’s been activated by the Bureau of Normalcy to find Niles Caulder. S01E11 Frances Patrol 26/04/2019 While Larry pays a visit to his long-lost love, Cliff and Rita travel to Gator Country to reconnect with his daughter. Vic worries about his operating system. Envie de parler de Doom Patrol ? Les discussions sont là pour vous. Retrouvez toutes les informations sur Doom Patrol lancée en 0000 : synopsys, casting complet, acteurs, scénariste, réalisateur. Découvrez des séries similaires à regarder également. Faites vous une idée de la série grâce à la note des membres et aux critiques des internautes.